Holidays are always a fun time, although there is a degree of stress for the person who is planning for the entire trip. Each person on the trip will add on to the stress factor. Apart from making sure that one has the right amount of currency and medication, there are also many other factors to take into consideration, including security. Those who are well traveled would know just how important it is to make sure that your backpack is well protected, and NXTPACK has come up with what is deemed to be the first anti-theft travel backpack in the world that has its very own integrated camera mounting system. Yup, this bad boy from NXTPACK is known as the Urbanvibe, where it will feature a magnet assisted FidLock Camera Mounting System built-in. Targeting professional photographers or simply people who have a great love for photography when traveling, the Urbanvibe offers an elegant and efficient solution for travelers and their respective photography equipment. After all, a camera is meant to be ready to shoot all the time, rather than to be placed within the confines of a particular area that is difficult to access. This backpack boasts of advanced anti-theft, organizational and accessibility features, apart from the built-in camera mount, of course. 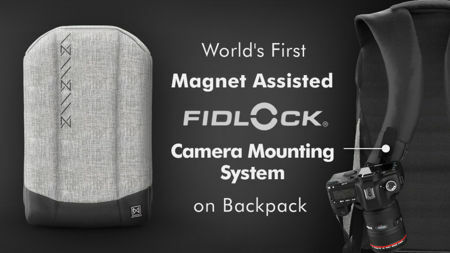 The magnet-assisted FidLock Camera Mounting System works this way: the wearer is able to attach just about any size camera to the shoulder, in order to be ready to capture a candid shot at all times. Current attachable mount clips are expensive, costing up to $70 or more, so why not get a backpack that already has one? There is also an integrated USB power bank, a telescopic cable lock and a hidden RFID pocket in terms of security features. Assuming the Urbanvibe makes it as a crowdfunding project, then the very first Urbanvibe backpacks will be ready to ship out this coming January 2018 with an asking price of $218 a pop.